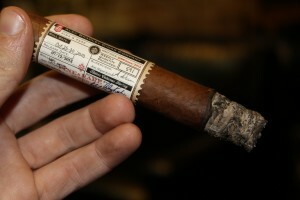 The first edition of the Alec Bradley Fine and Rare was released in 2011 and came in a single size, a 6 x 52 Toro. 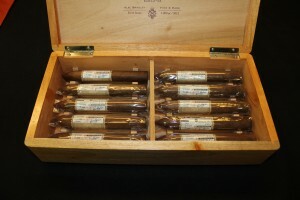 Only 1,100 boxes were made of the 2011 Fine and Rare, and it received alot of attention last year. This year the 2012 Torpedo version of the Fine and Rare is receiving a lot of attention as well. 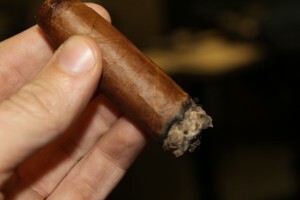 In fact, it was one of the big talking points at the 2012 IPCPR in the Alec Bradley booth. Much like the original Fine and Rare, the 2012 release is a very limited batch of 2,000 (1o count) boxes. Also like the original Fine and Rare, the 2012 version has a Honduran Trojes wrapper, and ten different tobaccos, but uses a variation of the 2011 blend. With all of the buzz surrounding the new Fine and Rare 2012 torpedo, I couldn’t wait to explore it myself. Construction and Appearance: The Fine and Rare 2012 has the same style of band as the 2011 version. It is more of an informational label rather than an actual band, in that it is much more informative than artistic like a normal cigar band. On it it lists the roll date (Oct 25 – 30, 2010), the weekly quantity produced (591), the rollers, the factory, and even the supervisor. The wrapper of the Alec Bradley Fine and Rare 2012 Torpedo is a medium brown with moderate veins and a bit of oil to it. The construction is excellent, quite seamless, but seems a little small for a 54 gauge. Flavor and Notes: The wrapper of the Alec Bradley Fine and Rare 2012 Torpedo has notes of wood, earth, nuts, and a little salt. The foot has a scent which is a combination of cocoa, salt, earth, nuts, and wood. To prepare smoking the Alec Bradley Fine and Rare 2012 Torpedo I use a straight cut and on the cold draw the flavor is a mix of earth, nuts, spice, and a little wood. Smoking Characteristics: The Alec Bradley Fine and Rare 2012 Torpedo kicks off with a blend of spice, nuts, earth, and a lots of wood on the first few draws. After the first few puffs, the spice starts to fade out and the notes of earth, nuts, and wood start to dominate the flavor profile. During this third, there is a nice savory, almost salty feel to the flavor. The smoke is cool, smooth, and has a creamy finish to it. The strength in the first third is mild to medium, yet the flavor is quite complex for the strength. Into the second third of the Alec Bradley Fine and Rare 2012 Torpedo, the flavors continue to evolve, dominated by notes that are earthy and nutty with a rich salty and savory feel. Now, a creamy and buttery flavor enters the profile along with a bit of a cocoa, increasing my enjoyment. The draw is excellent, easily providing a full body of smooth, rich, cool, sweet, creamy smoke. The ash holds firmly, easily past the inch point, with no flaking. I touch up the burn line a couple of times, nothing major and probably not necessary, but I want to ensure my enjoyment of this stick. The strength has increased slightly in this third, entering the medium range. 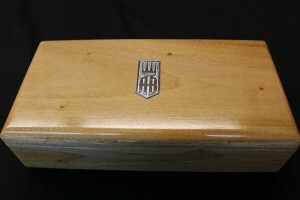 During the final third of the Alec Bradley Fine and Rare 2012 Torpedo, the woody notes re-emerge, closer to a cedar rather than a generic wood along with notes of leather. The sweet cocoa, butter, cream, earth, and nuts all also remain, giving the Fine and Rare a nice balance and complexity. The finish in this third is really what gives the cigar its unique feel. Each draw leaves a bit of butter, cocoa, and a rich cedar lingering on the palate long between each draw. The smoke production is excellent, each puff easily providing a full body of the smooth, cool, rich, creamy smoke. The construction holds up well in this third, the ash firm, the draw excellent, and the burn requiring no additional corrections. I end up smoking the Alec Bradley Fine and Rare 2012 Torpedo down to the nub, with it remaining cool and pulling no heat. Conclusion: The Alec Bradley Fine and Rare 2012 Torpedo is a very delicious savory cigar with a lot of flavors in the blend. It has an excellent finish, a wonderful balance, and a complexity to it that can be appreciated. The construction is impressive, the ash holding firm, the draw ideal, and the burn only requiring some minor touch ups near the middle of the cigar. Overall, the Fine and Rare 2012 is a cigar to appreciate. Dedicated fans should buy a box quickly, not many were made! Next: ACS NFL Sunday Challenge November 4th update! I went ahead and picked one up the other day. Part of me wants to hold onto it; the other says burn it now! Maybe soon! I've heard good and bad things about these. Your review gives me something to consider. Thanks! My B&M got 4 boxes of these in and almost 1/3 of them had damaged wrappers to the point we had to send them back! I blame the packing not the rollers. I picked up a few and can't wait to try them, wish I could of had more to buy.